Multi instrumentalist Tom Leighton brings sophisticated colours and novel arrangements to his music that few musicians can match. He plays piano, accordion, accordion bass, bouzouki, bodhran, whistles, jaw harps, mandolin and trombone— sometimes three of them at the same time! Multi instrumentalist, and indefatigable, Tom Leighton brings sophisticated colours and novel arrangements to his music that few musicians can match. 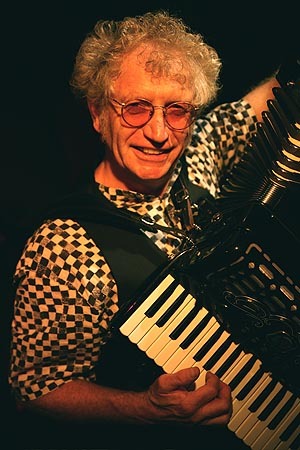 He plays piano, accordion, accordion bass, bouzouki, bodhran, whistles, jaw harps, mandolin and trombone— sometimes three of them at the same time!As a solo recording artist, Tom’s “Leighton Tendencies”, and “Leighton Life”, are projects starring his own compositions and arrangements and “…. featuring the writing skills and musical dexterity of this wonderful musician.” Whole Note Magazine. As half of the celebrated Canadian duo Mark Haines & Tom Leighton, Tom has three CDs with Borlealis Records. The duo have toured internationally and have headlined in folk festivals throughout North America. Tom performs and records with many artists; Mary Kelly, Marie Lynn Hammond, Nonie Thompson and Eugene Rae, Anne Lederman, Ian Bell and Conrad Kipping. He has written numerous chorale arrangements for school, community and professional choirs, many of which are based on the work of contemporary Canadian folk artists.